The OCJBA provides a social environment that will engender comradeship among its members, building upon the foundation of thousands of years of Jewish tradition steeped in the law (Torah), fostering the application of Jewish principles and morality, and committing good deeds (Mitzvot) and acts of kindness (Tzedakah) while practicing law and serving the community. 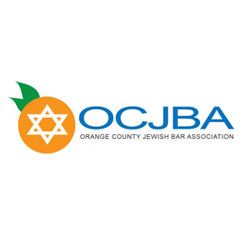 Today, the OCJBA serves the interests of the more than 100 Jewish legal professionals in the Greater Orange County area in addition to the broader Jewish community. Our events provide the OCJBA members and guests with a community to enhance peer to peer learning, professional development opportunities and networking for its members. At the OCJBA it is crucial that we fulfill our responsibility to make legal counsel available to the Orange County public, and the best way to accomplish this is through an effective lawyer-client matching service. Our attorney members cover a wide variety of practice areas and through this website you can get a quick response for a member who can effectively answer your legal questions.